This map shows the cruise track for the summer 2013 expedition with R/V Atlantis and ROV Jason. 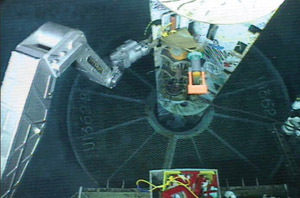 The image above shows ROV Jason's arm manipulating a pressure measurement system on the wellhead of the borehole observatory during the summer 2011 expedition. Images below show fluid sampling activities carried out by ROV Jason during the summer 2011 expedition. UC Santa Cruz hydrogeologist Andrew Fisher is leading an expedition on the research vessel (R/V) Atlantis this summer to explore fluid flow and microbial habitats deep within the ocean crust. His team is returning to a set of six borehole observatories they installed in the seafloor off the coast of British Columbia during earlier expeditions in 1996, 2004, and 2010. Using the remotely operated vehicle (ROV) Jason, they will collect samples and data and conduct new experiments. The public can follow the expedition online starting July 12 at the Atlantis Live web site, which features a live video feed, highlight videos, blog posts, and other information. In addition, the Seymour Marine Discovery Center will be hosting a talk with Fisher via a live connection to the R/V Atlantis on Sunday, July 21, at 1 p.m. as part of the center's Science Sunday lecture series. Massive flows of warm water move in and out of the seafloor, exchanging heat and chemical compounds between the volcanic ocean crust and the overlying ocean. These flows influence seafloor processes, the evolution of the oceans and the crust, and the development and maintenance of a poorly understood microbial biosphere deep below the seafloor. 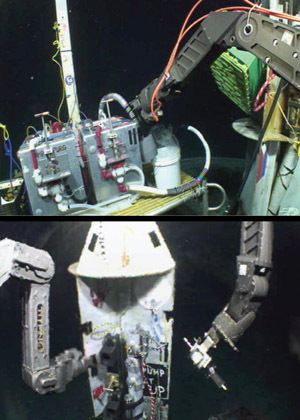 Experiments conducted during the 2013 expedition will include tracer and flow tests, to determine rates and directions of fluid movement, and microbial colonization experiments to determine what kinds of life inhabit the volcanic ocean crust. "Recent and ongoing surveys, experiments, and modeling studies are transforming our understanding of these complex hydrothermal systems and revealing flows that are more vigorous, dynamic, and extensive than previously thought," said Fisher, a professor of Earth and planetary sciences. The UCSC team accompanying Fisher on the expedition includes Dustin Winslow, a graduate student in Earth and planetary sciences, postdoctoral researcher Rachel Lauer, and Jackie Lopez, who earned her B.S. in Earth and planetary sciences at UCSC in 2012 and is now a graduate student in the Education Department's masters degree/teaching credential program. 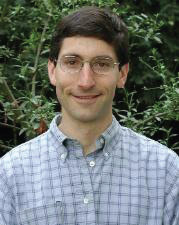 Fisher is the chief scientist for the expedition, with co-principal investigators from the University of Hawaii, University of Alaska, Fairbanks, UC Santa Barbara, and University of Miami. 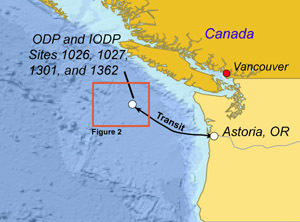 The borehole observatories are located on the seafloor about 100 miles west of Vancouver, B.C., at a depth of 1.5 miles. This is Fisher's ninth research expedition to this field site. A final expedition (with the submersible Alvin) is scheduled for the summer of 2014 to recover remaining instruments and additional data and samples. This project is sponsored by the National Science Foundation (NSF) and the Center for Dark Energy Biosphere Investigations (C-DEBI). The R/V Atlantis and ROV Jason are operated by Woods Hole Oceanographic Institution.